The right features to manage coaching; simple and flexible enough to adapt to your business. Coaching Director provides a collaboration workspace for each coaching engagement allowing you to keep all the critical information about the engagement at your fingertips, whenever you need it. Features can be enabled individually to track the exact information you want to record and maintain for your organization. Coaches can track their coaching activity – meetings, phone calls, interviews and other work associated with the engagement. Administrators can schedule other administrative activities before, during and after the engagement. Flexible security allows activities to optionally be shared between participant, coach and administrators. Record key contract terms, including overall budget and hours assigned for each engagement. This information can be rolled up to program and client level to view overall status and spend on your coaching activities. Coaches can create invoices, assign their activities to the invoice, add expenses and submit the invoice, all through Coaching Director, significantly reducing administrative time and ensuring accuracy of information. Features include partial billing of activities, invoice approval process, and an integration API to post invoices to your finance system. Coaches, their clients and program administrators share a coaching engagement workspace. Coaches can build a development plan with their clients with coaching goals and associated activities. They can share documents, schedule meetings, record notes and engage in discussions all within this workspace. 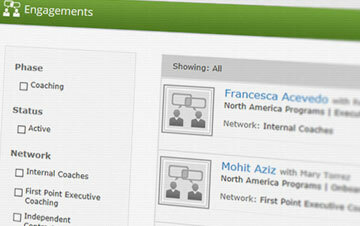 Granular permissions allow access for individual items to be limited to combinations of coach, client or administrator. With automated e-mail alerts, Coaching Director takes the burden out of keeping people informed and reminded of key tasks such as completing coaching profiles, and reaching and missing critical milestones.